A Bay Area native, Mr. Antoine Hunter is an award-winning African-American Deaf producer, choreographer, film/theater actor, dancer, dance instructor, model, poet, speaker, mentor and Deaf advocate. Mr Hunter received his training in dance and acting training at Skyline High School Oakland, Ca, California Institute of the Arts(CalArts), and Paul Taylor Dance School in NYC. 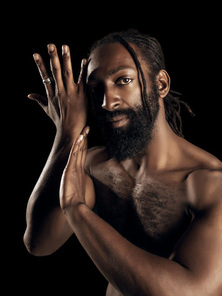 The founder and artistic director of Urban Jazz Dance, Hunter has performed with Savage Jazz Dance Company, Nuba Dance Theater, Alayo Dance Company, Robert Moses’ KIN, Man Dance, Sins Invalid, Amara Tabor-Smith, Kim Epifano, Push Dance Company, Fly Away Productions, Joanna Haigood, OET theater, and the Lorraine Hansberry Theater. He has performed throughout the Bay Area and the world including Cuba, Rome, Hawaii, Peru and London. Hunter is a faculty member at East Bay Center for the Performing Arts, Shawl-Anderson, Youth in Arts and Dance-A-Vision. He is the founder of Iron Tri-Angel Urban Ballet in Richmond, was an instructor and rehearsal director for the Ross Dance Company, dance captain for Expedia.com commercials and was head Choreographer director for an Philippines's Musical "Amerikana-The Musical". while he love doing short films and long films plus music videos, he was Head Choreographer for D-PAN: Deaf Professional Arts Network ASL Music Video: "Call Me Maybe" by Carly Rae Jepsen. Awards include the 2011 National Dance Week Dancer's Choice Award, Margaret Jenkin's CHIME award, the 2009 VRS Award (the international organization on arts and disabilities), and the 2000 Bay Area Star Award. 2016 receive many honor, just to name one New York's The Radio City Rockets' Pick for Dancer of the week; they quote, "Mr Hunter is talented and inspiring dancer, proving that you don’t need to hear the music to move to it beautifully." He has been featured in front cover DeafLife Magazine, plus featured in Dance Spirit Magazine, Dance Teacher Magazine, Dance Magazine, Dance Studio Life Magazine, and more but also had been quoted also in several texts books. He is known as former president of the Bay Area Black Deaf Advocate and Director-at-Large for the Northern California chapter of the California Association of the Deaf. He has been featured in Oakland North, CNN's The Great Big story, KQED's Arts, and many appearing for Purple Technologies, which sells Deaf services and products. Mr. Hunter is an active supporter of DeafHope, an organization whose mission is to end domestic and sexual violence in Deaf communities through empowerment, education, and services. He teaches dance and ASL in both Hearing and Deaf communities and is the founder and artistic director of Urban Jazz Dance Company and has been producing the Bay Area International Deaf Dance Festival since 2013. His projects have been awarded funding by both CA$H Theater Bay Area and the Zellerbach Family Foundation. Inclusive Design SME series featuring Antoine from Microsoft Design on Vimeo.